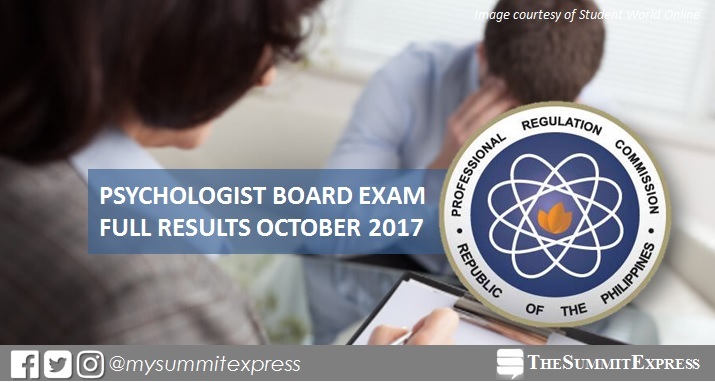 MANILA, Philippines - The October 2017 Psychologist board exam results including the official list of passers, topnotchers (top 10), top performing schools and performance of schools were released today, November 7, 2017 or in four (4)working days after the last day of exam. As announced, 96 out of 148 passed the exams. PRC conducted the Psychologist licensure exam in the city of Manila on October 29 and 30, 2017. Psycholosgist board exam's verification of ratings (passers, non-passers and removal) can be done online. According to PRC Resolution No. 2016-1019, the target release of results for the recent Psychologist board exam is on Tuesday, November 7 or in four (4) working days after the exam. In the August 2016 Psychologist board exam, a total of 63 out of 120 passed the exam. Cherie Ann Tam Lo from the Ateneo de Manila University (ADMU) - QC aced the board with 81.80%. In the July 2015 exams, 36 out of 76 takers successfully hurdled the series of tests. Sampaguita Quijano Adapon also from ADMU-QC topped the board with 82.30%.